Undelete partition step by step, simple and easy! When data loss happens to your hard disk, in general, it always has something to do with the hard disk partition. For example, all the following conditions can lead to data loss. - A certain partition disappears suddenly out of unknown reasons. This article, step by step, gives a detailed introduction of how to undelete partition. After finishing reading this article, you'll be able to become an expert of undelete partition! The article is a bit long, you can click the following links and read the corresponding content directly! 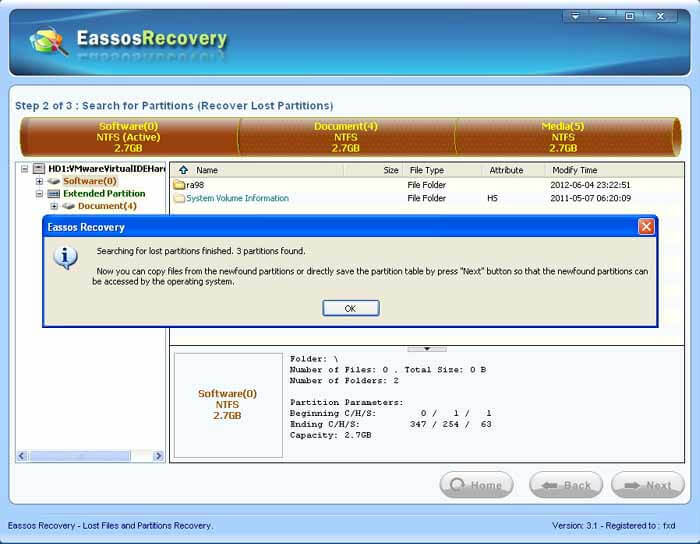 Step 11 - Recover Lost Partitions, problems that should be noticed. A hard disk can not be used by operating system directly. It must be divided into one or several partitions, and only after this can it be used by the operating system to store data. - A hard disk has at least one primary partition and at the same time has as many as four primary partitions. From above we know that a hard disk can have four primary partitions at most, thus how to divide partition into more than four partitions? This will need to use extended partition and logical partition. - Logical partition, within extended partition, can be directly used by operating system. The above picture shows the most common situation of computer disk and partition. A computer is equipped with a hard disk (HD0: HITACHIHTS...), and the hard disk contains a primary partition (Local Disk), whose drive letter is C, and an extended partition which includes several logic partitions whose drive letters are D: E: F: ...etc. Above all is the most basic knowledge about disk and partition, which will help you a lot with your operation of undelete partition. 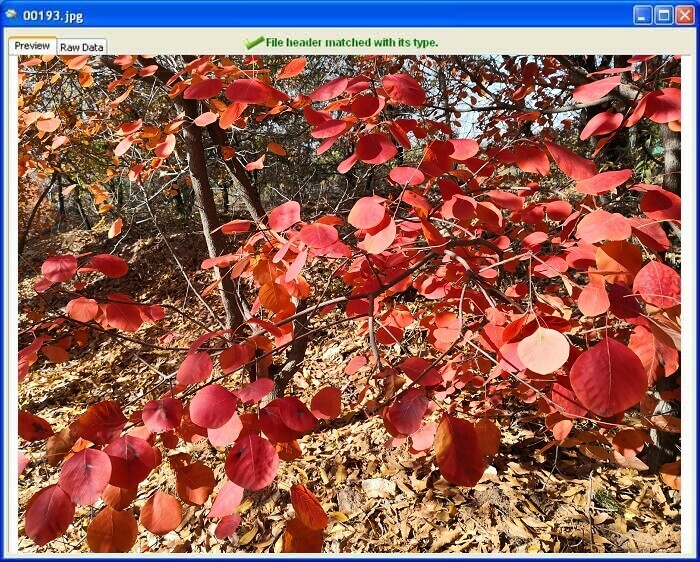 Would you like to learn what the best undelete partition software is? Let me tell you, it's Eassos Recovery. 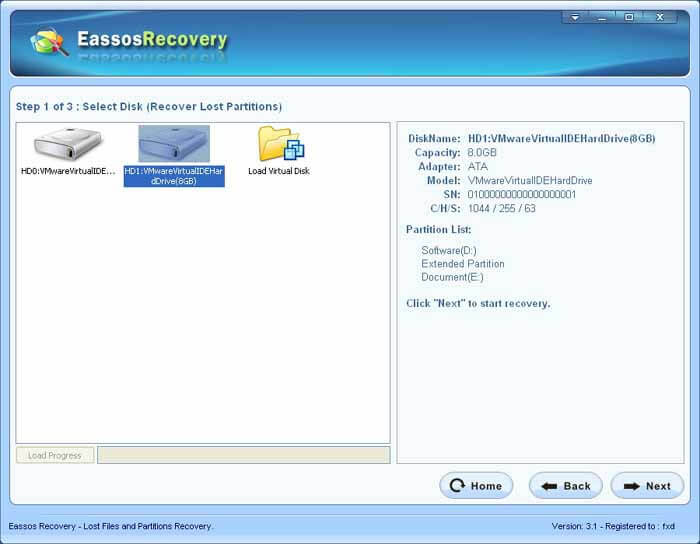 Eassos Recovery has powerful undelete partition functions, meanwhile it is the easiest one to operate. 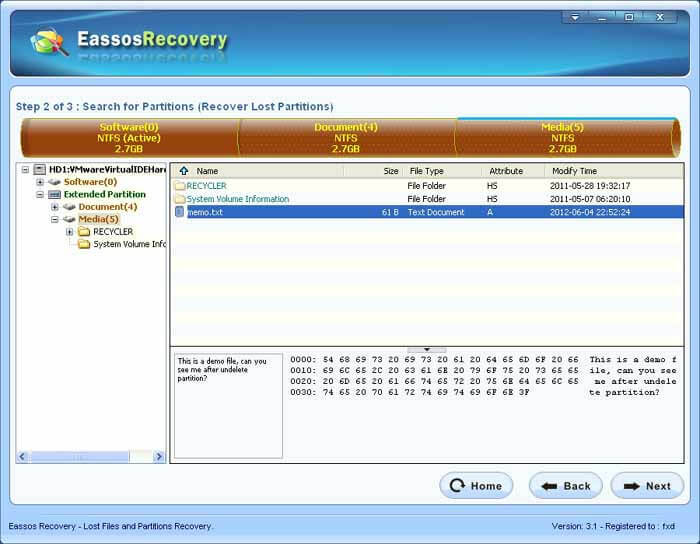 Its wizard interface allows you to know how to recover partitions only by a glimpse of it! 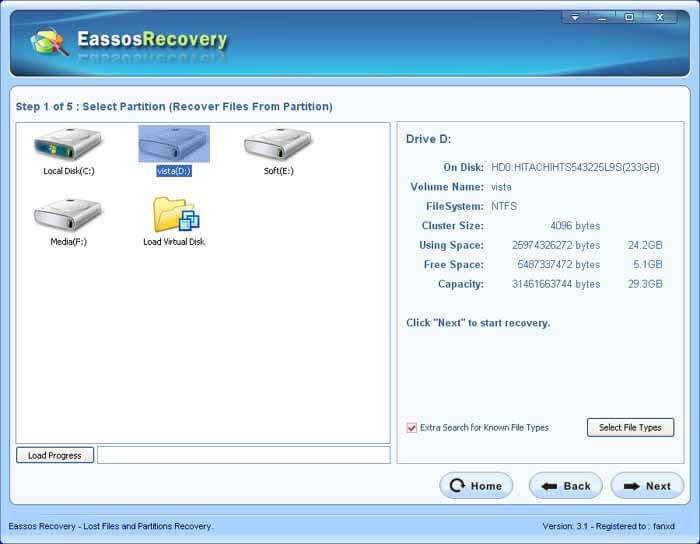 Other parts of this article, taking Eassos Recovery as the tool, devote to explaining how to undelete partition step by step! If you are a computer professional, PartitionGuru may fit you better. 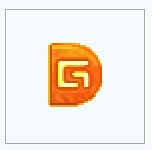 PartitionGuru is All-In-One solution for data recovery and partition management, including powerful function of undelete partition. It will make you fondle admiringly when you using PartitionGuru. If you want to know more about PartitionGuru, please visit www.eassos.com/partitionguru.php. Now, let's start the operations of undelete partition! The operation of undelete partition usually uses the first two recovery modes: Recover Files From Partition or Recover Lost Partitions. Which mode do we actually use? 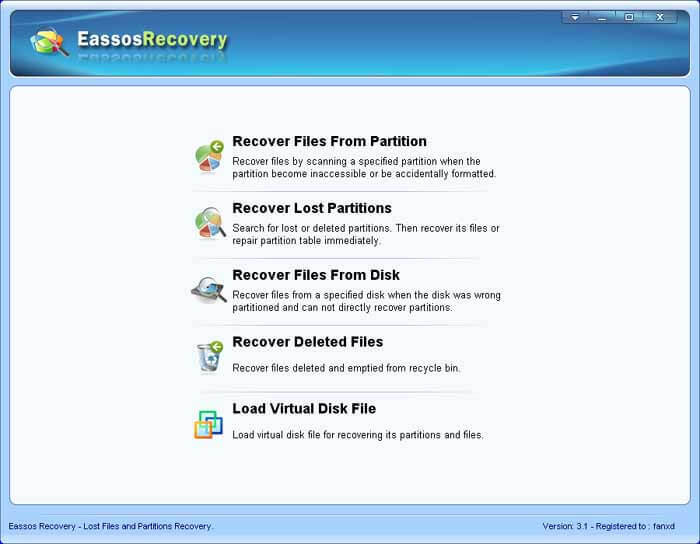 In fact, Eassos Recovery has already explained clearly in the main interface! Please use this mode to undelete partition if the drive letter of the partition still exists. The partition is just formatted by accident or inaccessible due to some reasons. Please use this mode to undelete partition if the drive letter of the partition has disappeared, commonly due to deleted partition carelessly, or partition disappears suddenly out of unknown reasons. When you restroe Windows system with backup software such as Norton Ghost, the original partitions may be lost with wrong operation or other reasons. In this case, you should use Recover Lost Partitions mode also. Next, we'll explain the detailed operations about the undelete partition mode of Recover Files From Partition. 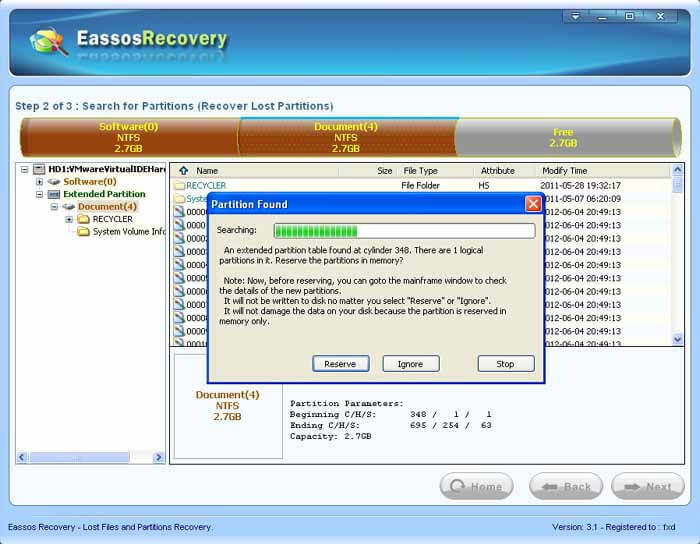 If you want to learn Recover Lost Partitions at once, please visit here. 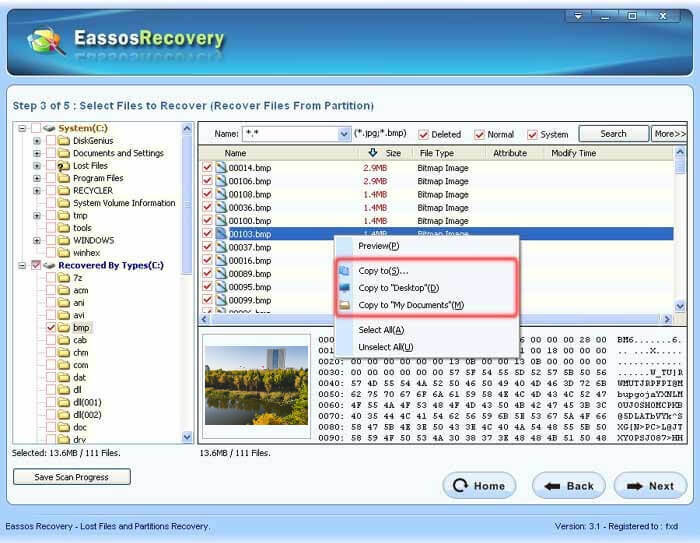 Click Recover Files From Partition in the main interface of Eassos Recovery, and the following interface will appear. 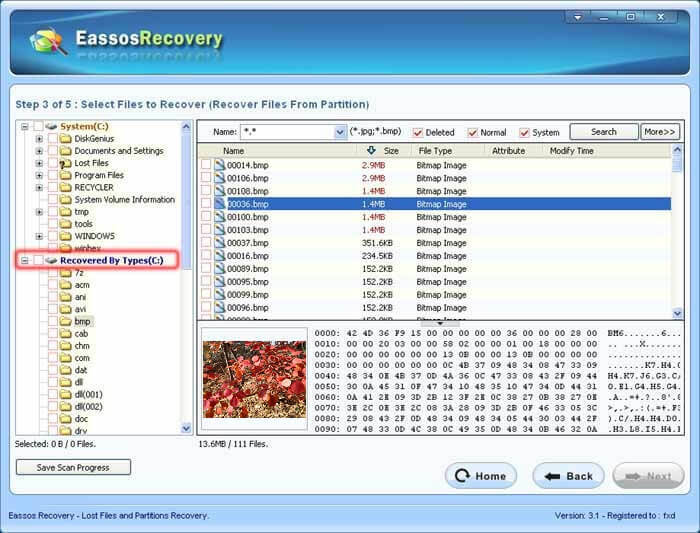 It is very convenient to find the files and folders you want to recover, whose operation is similar to that of Windows Explorer. The following skills can help you filter files and directories better. b. You can just check "Deleted" to narrow down search range, which is shown in the following picture. c. You can narrow down the search range by limiting files' size and modification time, as shown in the below picture. d. By way of previewing, you can judge whether the file is the one you want to recover, just as the picture shows below. e. Double click the preview window, and you can preview the file in the normal size! As the following picture shows. The preview supports all formats of image files, txt fiels, and Office document files such as Word Excel and PowerPoint files . f. When you can't find the files that need recovering by adopting other methods, you can try Recovered By Types to see whether it has the wanted files! You can also click the button "Next", and select a destination folder, as shown in the following picture. 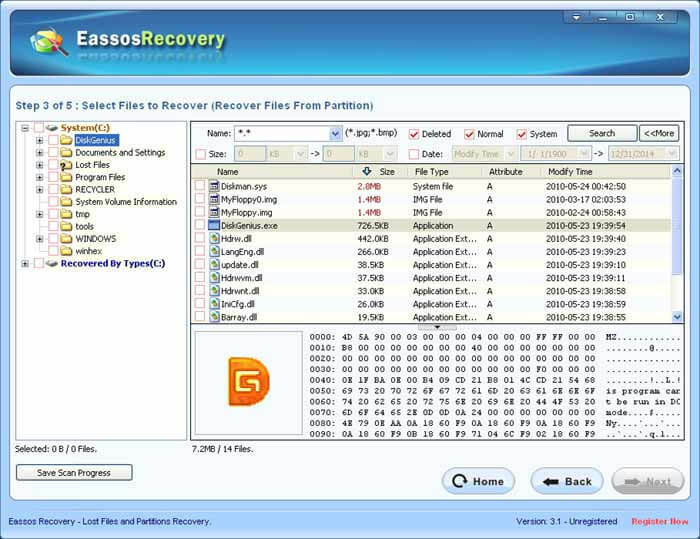 Click "Next" button, then Eassos Recovery will copy the files and folders you choosen to the destination folder. Next, we will explain the other undelete partition mode : Recover Lost Partitions. We have made a detailed explanation of this matter before, please refer to "Undelete Partition Step 3 - Select right recovery mode, Recover Files From Partition or Recover Lost Partitions". 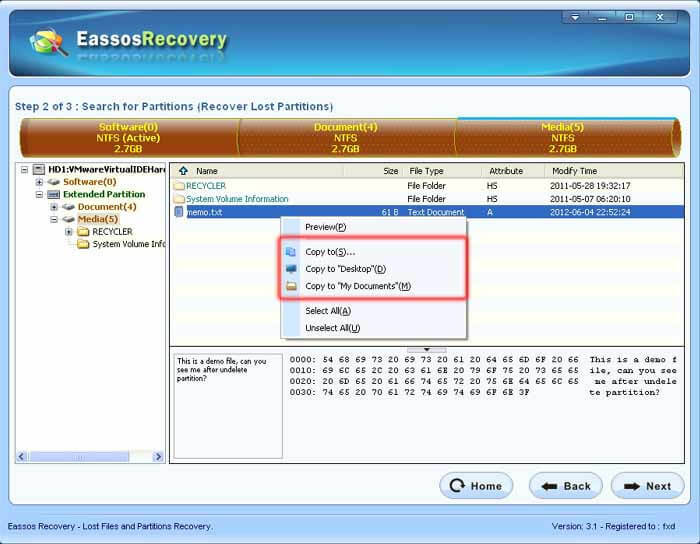 To let you have a better understanding of the recovery mode "Recover Lost Partition", we'll explain it at length through an actual case. The following picture shows the actual hard disk partition settings of the author's computer by using the PartitionGuru. The computer has two hard disks (HD0 and HD1); HD0 has a primary partition, and HD1 has a primary partition whose drive letter is D: and an extended partition which has two logic partitions named as E: and F: . As to some concepts like primary partition, extended partition and logical partition, this article has given a brief introduction of these concepts before, and readers who are not familiar with them can prefer to Undelete Partition Step 1 - A brief introduction of partition, primary partition, extended partition and logical partition.. Please pay attention to the volume label, location and space occupation of partition D, E and F in the HD1, which is very useful to the later undelete partition! In addition, please note that there is a text file "memo.txt" in the roor folder of partition F , through the document preview function of PartitionGuru, we can see the content of the file "memo.txt": this is a demo file, can you see me after undelete partition? 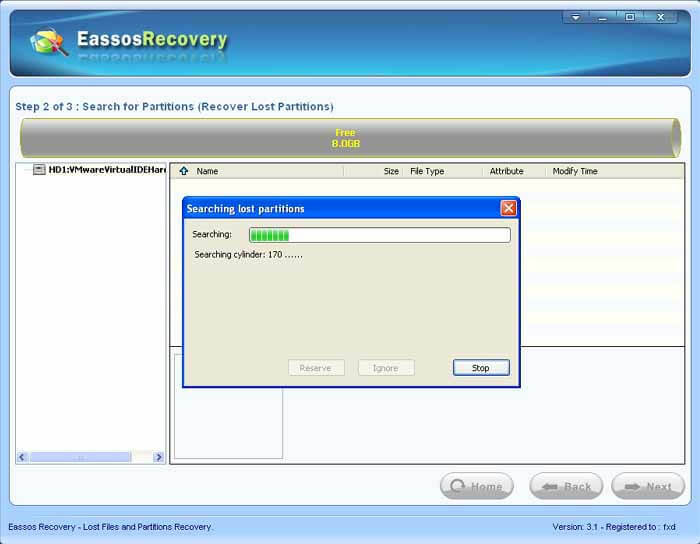 Now we use Eassos Recovery to recover the deleted partition F step by step. 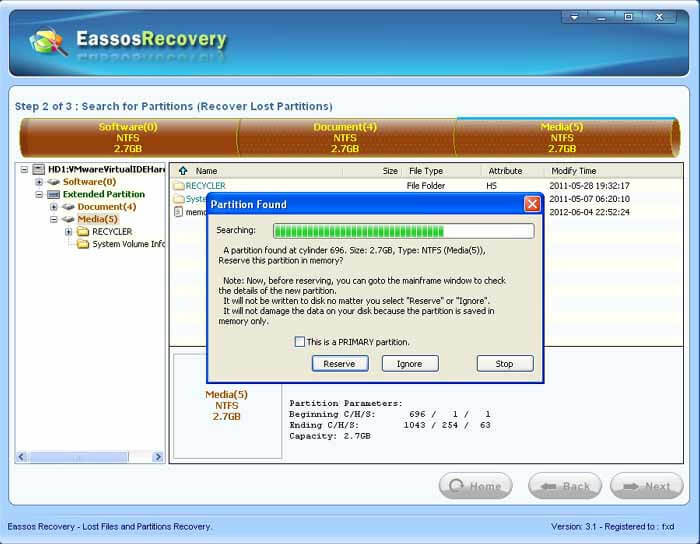 Eassos Recovery will start to scan hard disk and looks for partitions. Having found partition, how to decide whether the partition should be kept? In fact, according to the methods below it's easy to judge! 2. By checking the files and folders in the partition, you can decide whether the partition should be kept. As shown above, judging from its location, size, and volumn label, the partition, which has been found, is obviously the original primary partition D , and it should be kept! This time an extended partition and its first logical partition are found. 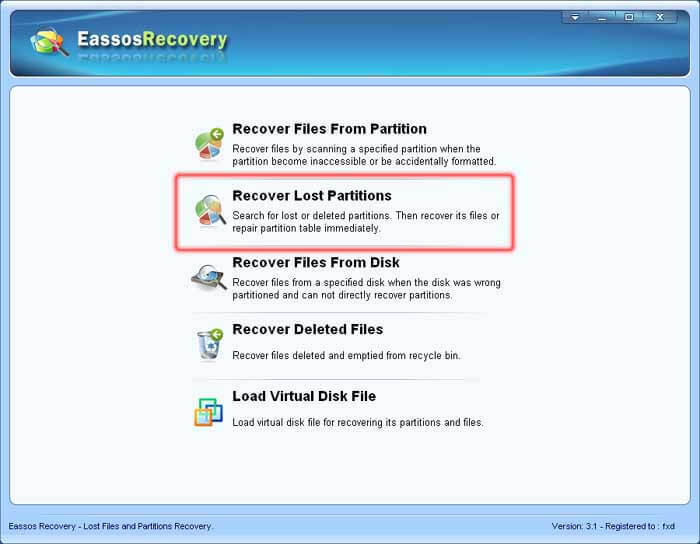 Usually, after Eassos Recovery finds an extended partition, it finds the extended partition's first logical partition meanwhile, as the above picture shows. Judging by the logical partition's location, size and volume label, the partition is the original primary partition E , and it should be kept! On the basis of the partition's location, size, volume label and the files and floders it contains, we can judge this partition is just the partition F we deleted, i.e. it is the partition we want to recover, so it should be kept! If there are many files and folders in the recovered partition, it'll take a lot of time and extra disk space to copy them, thus, you can also select not to copy data but recover partitions in situ directly! In-situ partition recovery is one of the most exciting functions of Eassos Recovery. 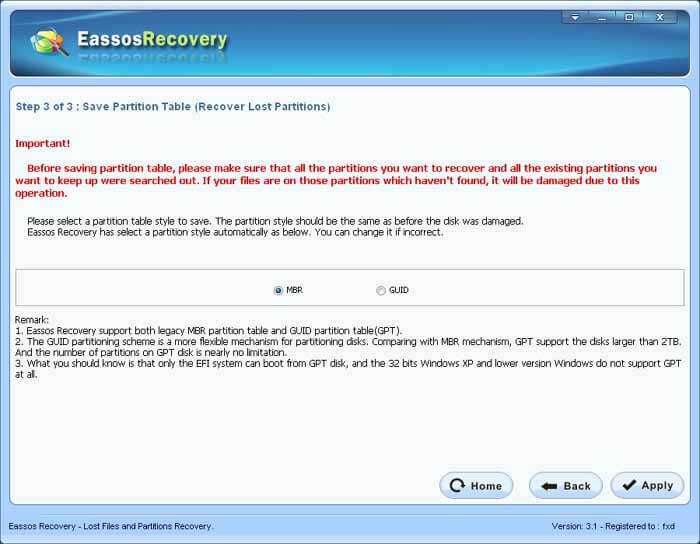 Click the "apply" button to save partition table, and the deleted partition will be recovered in situ directly! 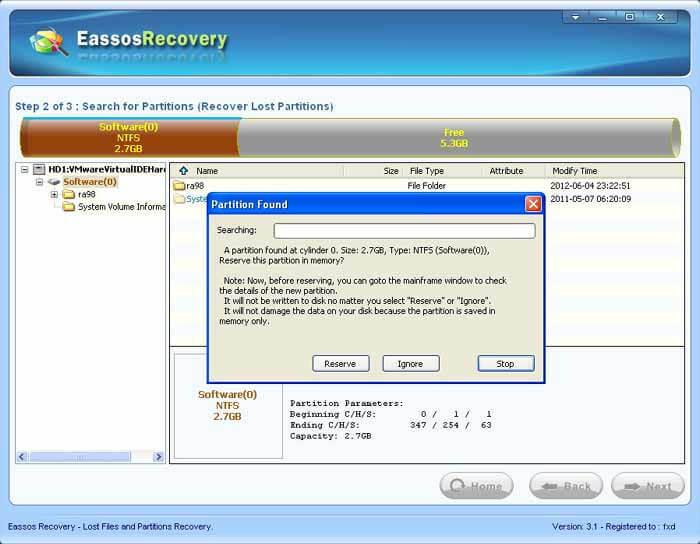 As you have seen, recovering lost partition by using Eassos Recovery is convenient and quick; even though you know little about computer, you can learn to use it easily! Because of the complexity of in-situ partition recovery, in some cases, some of the following problems will appear occasionally, and you need to know how to deal with them. This phenomenon is common after the faulty operation of Ghost and in-situ partition recovery, which is easy to understand, for the current partition C is replaced by the original one, and some files of the original partition C are covered, therefore, the Windows can not be entered. How to deal with it? It's very easy, just re-do the Windows system and it'll be OK! This problem is caused by Windows' mechanism of distributing partition's drive letter; although the chance of such situation is very small, you need to know how to deal with it! First, restart Windows to see whether drive letter can be distributed automatically, if not, just distribute it manually by using PartitionGuru or Windows' built-in disk management tools. The most reliable way is copying out important data before the in-situ partition recovery, and it will be perfectly safe!